NEW YORK, Sep. 26 /CSRwire/ - In celebration of the fall returns of hit music dramas EMPIRE and STAR, Fox Broadcasting Company and parent company 21st Century Fox have teamed up with Turnaround Arts, a national program of the John F. Kennedy Center for the Performing Arts, for a new social campaign. As one of the marquee national education initiatives of the Kennedy Center, Turnaround Arts empowers struggling schools with innovative arts programs and arts-based learning across subject areas as a strategy to help address broader school challenges and close the opportunity gap. 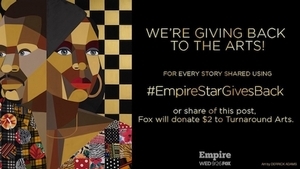 On the Season Five premiere of EMPIRE, airing Wednesday, Sept. 26 (8:00-9:00 PM ET/PT) on FOX, two years after losing Empire to Eddie Barker (guest star Forest Whitaker), Cookie (Taraji P. Henson) and Lucious (Terrence Howard) are still in the midst of picking up the pieces. The family is now completely dispersed and coping in their own ways after experiencing unimaginable tragedies. Meanwhile, in an effort to reclaim the Lyons’ position in the music industry, Cookie sets her eyes on atalented new singer and rapper, Treasure (guest star Katlynn Simone). The John F. Kennedy Center for the Performing Arts is America’s living memorial to President John F. Kennedy, attracting millions of visitors each year to more than 2,000 performances, events and exhibits. With its artistic affiliates, the National Symphony Orchestra and Washington National Opera, the nation’s busiest performing arts center is dedicated to providing World-Class Art, Powerful Education and an outstanding Memorial Experience to the broadest possible constituency. Across all its offerings, the Kennedy Center is committed to increasing accessible, inclusive opportunities for all people to participate in and learn through the arts, including more than 400 free performances each year and a variety of Specially Priced Ticket programs for students, seniors, persons with disabilities and others.To learn more about the Kennedy Center, please visit www.kennedy-center.org.